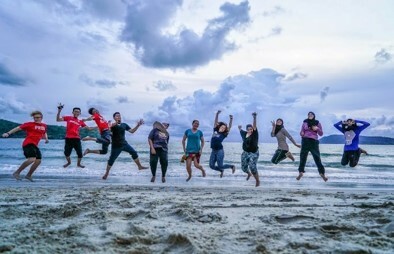 Hands-on field explorations and visits to eco-tourisms and coastal communities in Johor to understand the current condition and development of coastal and marine environment. 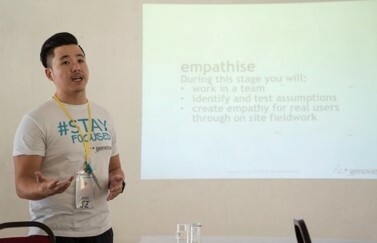 Practical workshops and inspiring talks delivered by corporate and environmental experts to improve skills, knowledge and motivation of participants. 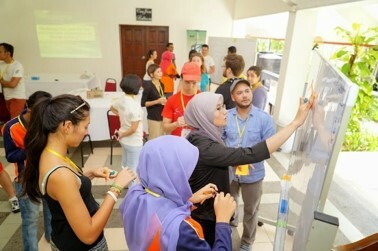 Action spaces in producing constructive ideas and sustainable solutions to support marine and coastal issues in Johor. 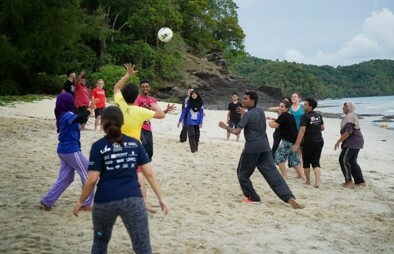 Fun and interesting team building activities to foster relationship and bonding between participants. *The tentative may be subjected to changes for further improvisations and improvements. How can anything start without a proper opening ceremony? 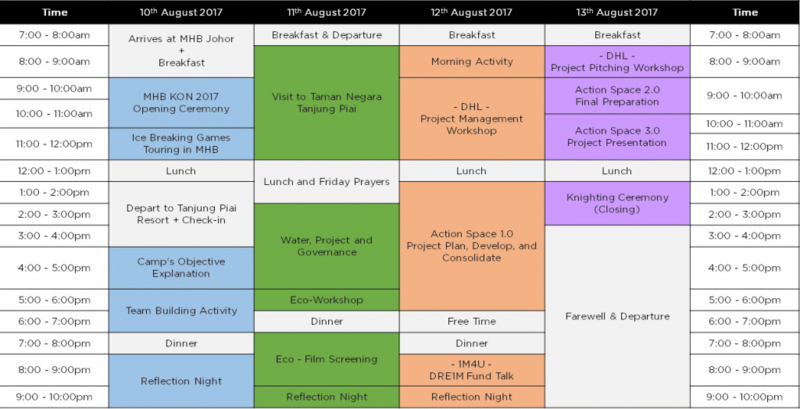 We gather at our starting point in MHB Johor to officially MHB Knights of Nature Sustainability Camp 2017! Thanks to our awesome partner, MHB for making this camp happens! Let’s get to know each other (GTKEO) after having everyone! We will be having some simple and fun ice breaking games to warm the crowd! At the same time, MHB will bring the participants around their industrial area in order to understand what they do! It is important to explain what this camp is all about to ensure that we can all be in the same page! During this slot as well, EcoKnights president, Mrs Yasmin Rasyid will be delivering an inspiring and motivating talk to all participants too! Bonding is always lovely in a camp. Team building activity is here to make bonding happens between participants! What is it going to be? You will know when you are there! Heh! 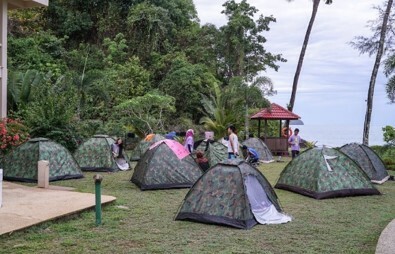 Reflection night serves as a time for participants to recall their learning of the day, thoughts and feelings generated throughout the day in the camp. We believe that reflection is significant to understand yourself more at the same time get connected with others too! Learning goes beyond the classroom, and probably way more than being in the classroom! 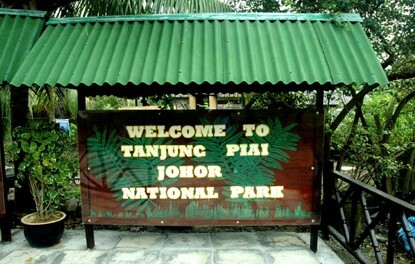 Apart from sitting in the camp site, we will be visiting Taman Negara Tanjung Piai in order to understand and experience the coastal and marine development in Johor! P/s: We will be standing at the southernmost tip of mainland Asia, linking between Singapore, Indonesia and Malaysia! How does all these 3 relates together as a topic? Our vice president of EcoKnights, who is also a very experienced environment activist Mr Amlir Ayat will let you know! Of course, you are not going to just sit there and listen to him. Introducing our unique workshop from EcoKnights! We will be having 1-2 environmental related workshop to spark some simple green ideas to more people, and we start / continue with you! Another famous aspect of EcoKnights is eco film screening! We will play an interesting documentary relating to marine and coastal development in Malaysia. We definitely need energy in the morning! A morning activity will hype you up and pump you with the greatest energy you need to start the day! You will never want to miss this – one of the greatest things for everyone wants to know the 101s to initiate a project themselves! Proudly presented by DHL, this workshop will educate participants the right skills and knowledge needed for project management! Knowledge, checked! Project Management Skill, checked! It is time to take action as a team! 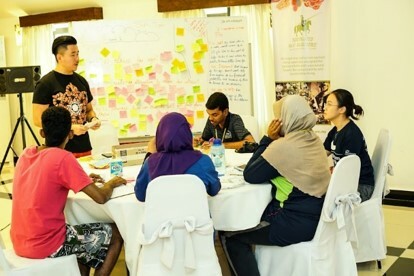 Facilitated by DHL as well, action space serves as a practical platform for participants to plan, develop and consolidate a sustainable environmental project related to the theme in order to help solving the environmental issues! Have you heard of IM4U DRE1M fund? 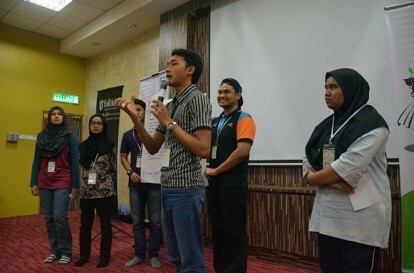 It has been funding various projects run by youths in Malaysia over the years! Let’s get to know more from here! Apart from project managing, it is also an important to know how to communicate and sell your project! 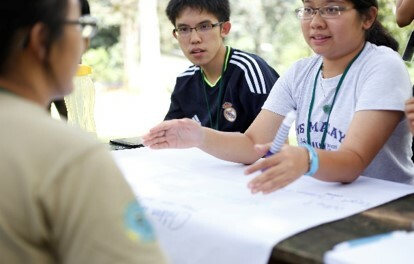 DHL will be sharing some tips, do’s and don’ts during project pitching to all participants! A final space for all project groups to consolidate their project framework and presentation with the support of group facilitators! Time to showcase everything you have and present your awesome group project to our panels! The team with the best project framework and pitching will be rewarded with something amazing! Every goodbye makes the next hello closer. Official “graduates” from MHB KON Sustainability Camp 2017 will be going through a knighting ceremony to be honoured as the Knights of Nature. 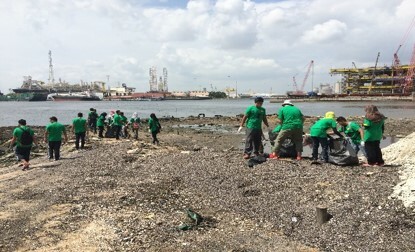 We are all ready to strive continuously in tackling environmental issues all around Johor and Malaysia!